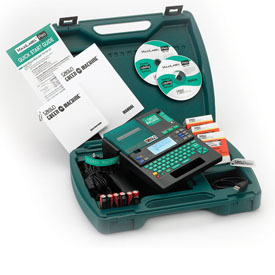 K-Sun Green Machine 2020LSTB-PCD Label Printer - The ultimate labeling system includes hand held portability or desktop PC connectivity all in one unit. Using durable thermal transfer print technology, the printer has its own battery operated memory, keyboard and LCD display so permanent labels can be designed and printed on the job, anywhere. Or, connect the printer to your PC and drive this powerful machine with new MaxiLabel® Pro software and AC power. This allows for use of full size computer keyboard and large screen monitor to design, edit and print labels easier and faster than ever before. New Tape Management System reduces tape waste with margin and cutter settings and label length preview function. PC and printer system offers 150-pre-set wizards to make label design fast and easy. Users can import custom symbols and graphics into label designs. Date and time stamp, enlarged label printing, custom frames and templates, repeat printing, 8-lines of text and hundreds of other label design functions are available on command. Includes: Labelshop 2020LSTB-PCD Machine, Ac Adapter, "6" AA batteries, (1) 1" Blk/Wht Tape Cartridge, CD Software, USB Cable & Carrying Case. Uses same supplies as 2011XLB-PC & 2012XLST-PC.